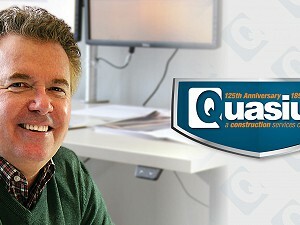 Steve Woods, aka “Woodsie”, Quasius Construction Executive Vice President, Special Project Division, is a true testament of Quasius’ brand – building relationships. He has helped to transform Sheboygan County and Quasius, working with customers for more than three decades to provide construction services and help achieve their business goals. Beginning in January 2019, Steve transitioned into a consultancy role for Quasius, where he will continue to work with existing customers and assist in the development of Quasius’ growing team of construction professionals. Steve will also continue to work with Quasius’ Special Projects Division, created to meet customers unique and smaller construction project and maintenance needs, overseeing project estimates and scheduling. Day-to-day operations will be managed by General Manager Ryan Guentner. Ryan’s hands-on construction and project management experience will continue to ensure customers get back to business quickly with cost-effective, innovative, and timely solutions.